Paul Janeway regularly gives the kind of performance that compels you to pay attention. There's no denying that the man who once trained as a preacher in Alabama was meant to be fronting a soul band. 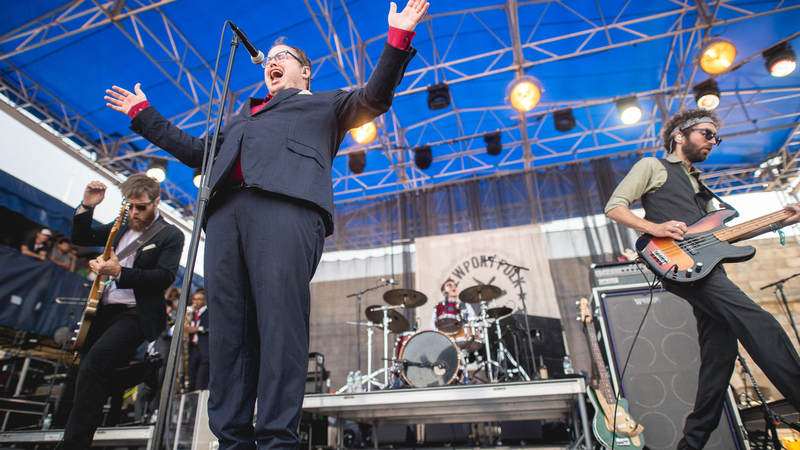 During an early-afternoon set at the Newport Folk Festival, Janeway put St. Paul & the Broken Bones through its paces, storming the stage with electric presence and a thunderous voice that pays tribute to — but doesn't imitate — his idol, Otis Redding. At one point during "Broken Bones and Pocket Change," he tore the sequined loafer off one of his feet and pressed it to his face, leaving a visible print on his right cheek, before collapsing onto the ground to howl the rest of the song. Janeway's stage antics can sometimes obscure the band's talented horn players and rhythm section, so let's give them some shine. Trumpeter Allen Branstetter, saxophonist Jerome Amori Ansari and trombonist Chad Fisher pivoted from convincing Memphis licks to chorale-like sections, while guitarist Browan Lollar, drummer Andrew Lee and bassist Jesse Phillips held down a rock-solid, laid-back groove throughout the set. The Newport Folk Festival performance was the band's last show in the U.S. before its second album, Sea Of Noise, comes out in September, and it teased the new album with a few fresh songs, such as the funky, hopeful "Flow With It" and the more explicitly political anthem "All I Ever Wonder." Hear the whole set at npr.org. "Take The Ticket And Ride"
"Broken Bones And Pocket Change"
"Flow With It (You Got Me Feeling Like)"